The Masters Tournament returns for 2018 and once again all the top DFS golf sites will have a big fantasy contest for the Masters. 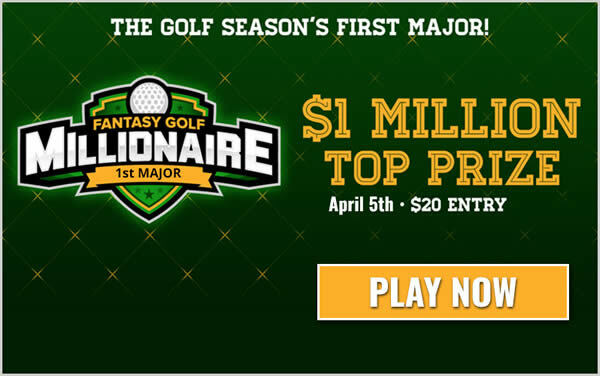 Leading the pack again with the largest contest for the Masters is DK with their DraftKings Fantasy Golf Millionaire Contest with a grand prize of $1 Million going to the winner and $3.5 Million in total prizes. The full list of fantasy golf sites that are running a special 2018 Masters Contest can be found below as well as what promo you can get if you sign up through our exclusive links and make your first deposit. Remember also that every DFS fantasy golf site will also have smaller games to play and some FREE Fantasy Golf contests for the Masters Tournament. Check them all out and see where you can make the most money this week. Click the banners or links for details on all the 2018 Masters contests, keep in mind, some of the smaller fantasy golf sites like FantasyDraft may have less competition and have some overlays in their big contests which improve the odds for you this week too. Still the biggest and still the best fantasy golf contest for the Masters. DFS fantasy golf players can win a 1st place prize of $1 Million for just a $20. We will drop multiple lineups for this one in hopes of cashing a nice payday after the final round on Sunday! Update - There are now details on a FREE Fantasy Golf Contest for the 2018 Masters as well - Click the graphic below for access to the FREE Fantasy Contest for this week only! FantasyDraft.com is running their annual Masters Tour card contest. $25 gets you a shot at a 1st place prize of $3,000 and $25K in total prizes. If you already have lineups set for the two contests above why not take a shot at this one too. Fantasy Draft also has free contests (no prize money, just for fun) to play fantasy golf games for the Masters Tournament. Do you want some true expert picks for your Masters fantasy golf lineups? Then it's time to try out Golfstats.com. Their research tools are awesome and on top of that they give you fantasy picks too! We've used them since the beginning of 2018 and have done better with their picks than our own. If you want an edge over the competition for this Masters, check them out.